Oh yay! 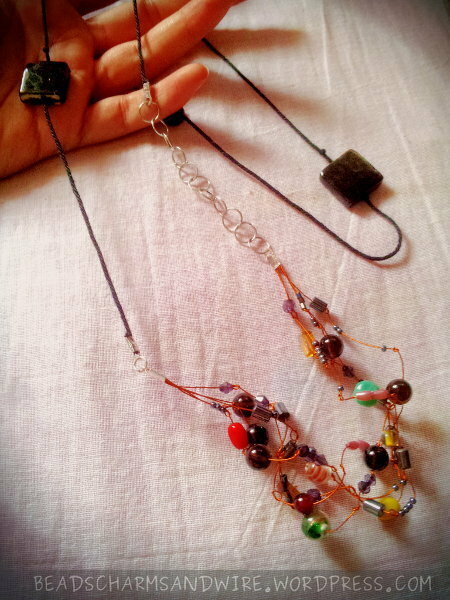 My first attempt at an asymmetric necklace is successful, I must say. 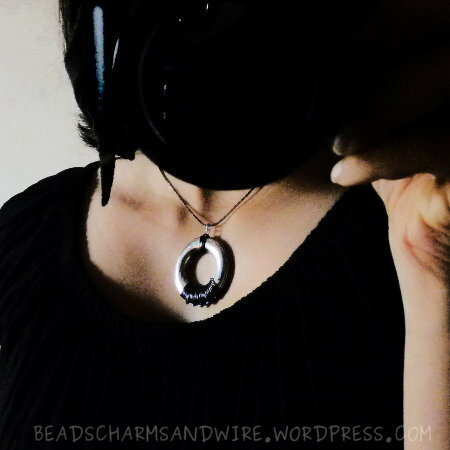 The necklace is 90cm (36″) long overall. I started out wanting to make something just like this, and this is one of the few times the result of my work resembles whatever is in my head when I begin. I cut out 5 lengths of copper-colored flexible wire, each measuring about 25cm (10″.) I gathered them into a bunch and secured one end of it using a crimp end. 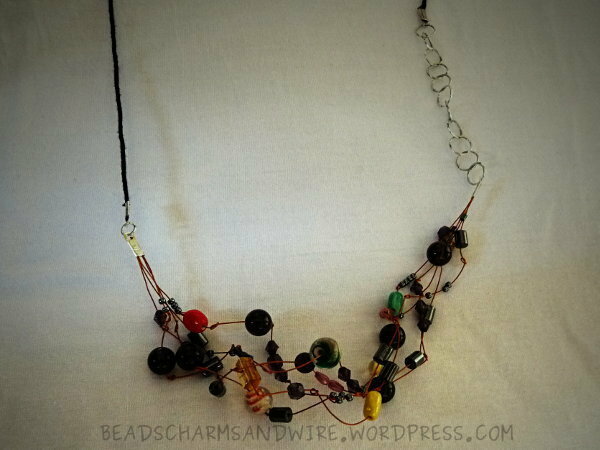 Then I started working with each wire individually, adding beads and securing them. I used a whole lot of assorted beads for this — seed beads, bugle beads, glass beads — of different colors. 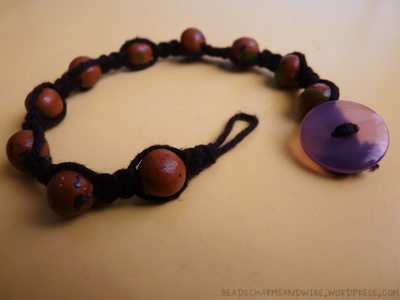 I strung one or more beads into the wire, and added a simple knot. I repeated the stringing and knotting until about 3-4cm (1.5″) was left in each wire. To make it look more random, I crisscrossed the wires, and loosely plaited them, and wound some wires around some others — anything that would make the piece look unstructured. I then picked up the free ends of all those wires, strung more beads into each — no knots this time — and carefully secured this bunch again using a crimp end. There weren’t any extras for me to snip off, but you could do that now if you have wires showing. 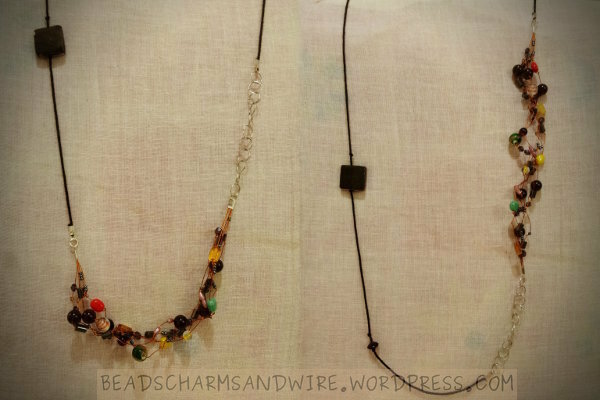 This completed the assorted-beads portion of the necklace. Next was the jump rings section. 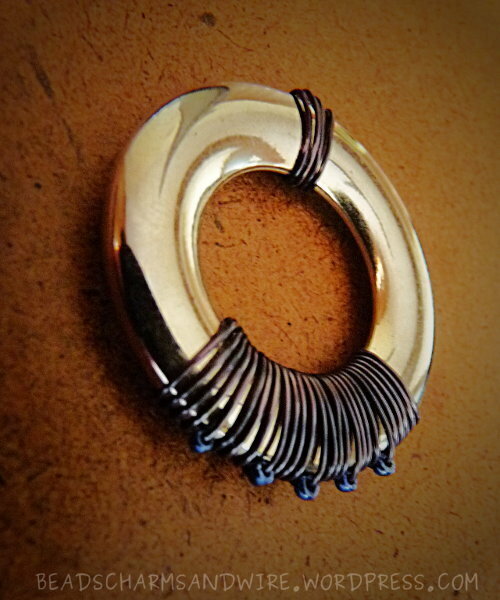 I connected medium-sized jump rings into a chain until I was happy with its length, and connected one end to the crimp end of the beads segment that I just completed. 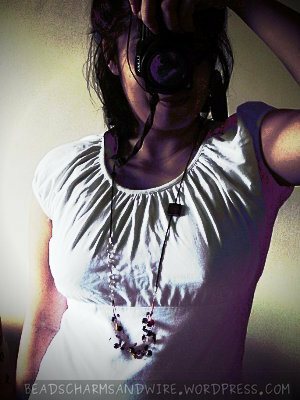 And here’s a (post-processing-effects-added) photo of a happy me wearing it – Sooo… what do you think of the chain? I’m back to using paper beads! 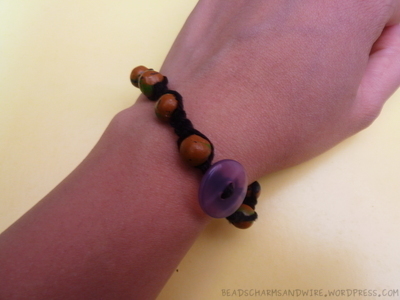 I didn’t make new ones for this bracelet that I cobbled together, instead I reused some beads from a set that I’d made years ago. They’d been a part of some jewelry piece for a long time, but have been back in my stash for a while now. 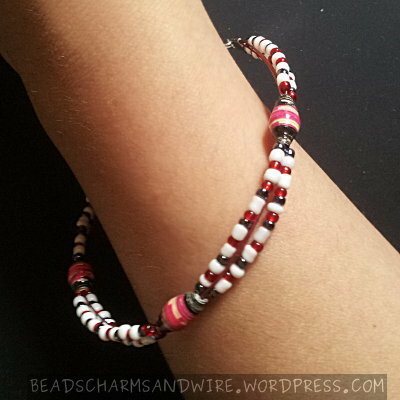 I just love the shocking pink on the paper beads! It goes really well with the black and white. 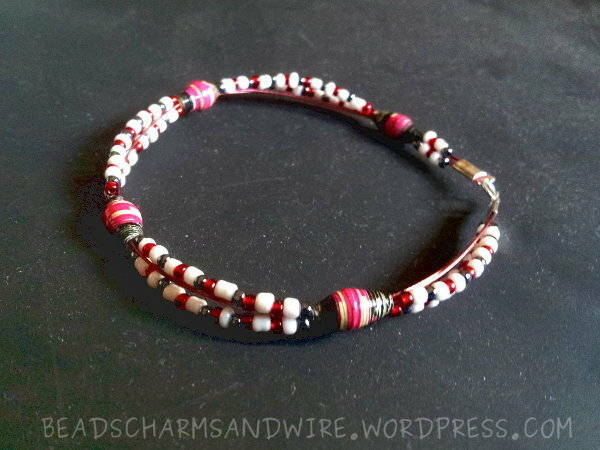 To make the rest of the bracelet look compatible, I used white, black / hematite and red seed beads. To start with, I cut 4 lengths of about 20cm (8″) flexible copper wire. I crimped one end of the bunch, and strung seed beads through two of the wires. (Using all four wires for beading was overkill, but using just two wires made the structure not strong enough.) After around 1/5 of the wires was threaded, I added a paper bead, passing all four wires through it. 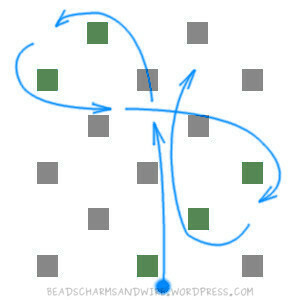 More seed beads and paper beads followed. Finally, I crimped the other end of the wires and snipped off the extra. A small jump ring through both crimp tubes was enough to make the bracelet slide on and off my hand without requiring a clasp. No, that’s not some kind of drink, it’s what I call these dangle earrings that I made. I ended the shaping with a spiral that is the flower, which I used my round-nose pliers to make. Then I strung the bottom of the bead into the stalk of the flower, pressing the flower against the bead with the right amount of stalk showing. I made an eye loop at the top, and snipped off the extra. I then added an earring finding to it. 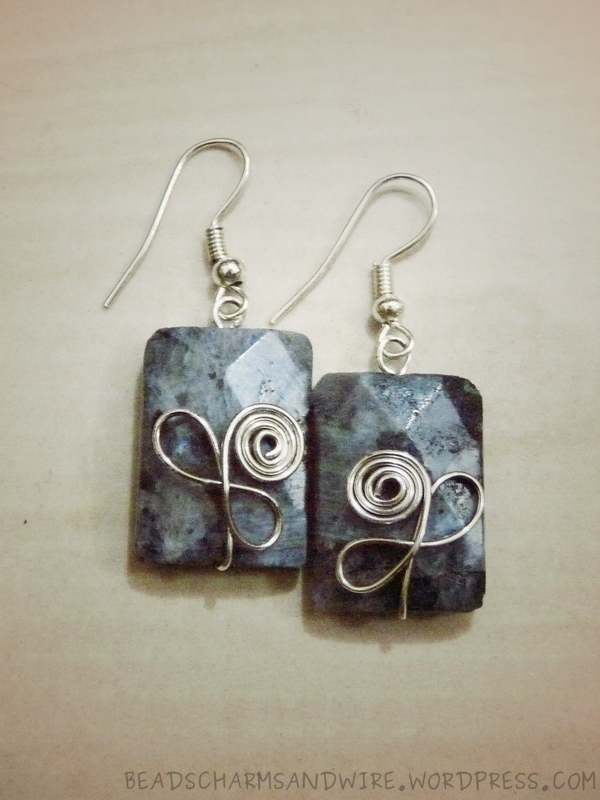 For the other earring of the pair, I rotated the jig instructions to mirror the one shown in the picture, and made the flower spiral in the reverse direction too. That’s it! How do you like these?